Beautifully crafted in a weathered oak, this architect desk is a unique workstation piece ideal for engineers, artists, or anyone who enjoys the feel and style of an adjustable top desk. The large spacious surface is easily movable by two side rings to position in a variety of angles to fit your preference. Reduce neck tension by easily working on projects or reading from an angled position. Or, use as a traditional flat top desk if you want to display decor or hold papers, office supplies, and a lamp. Finished in a sturdy trestle-style base with thick feet, this desk brings you high-quality construction that will last for years to come. 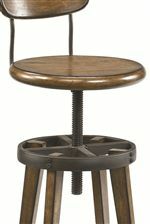 Pair with the matching oak adjustable stool to complete the rustic, contemporary style. The Studio Home Architect Desk and Adjustable Swivel Stool by Hammary at AHFA in the area. Product availability may vary. Contact us for the most current availability on this product. 166-940 Architect Desk 1 52.75" 32" 36"
166-948 Adjustable Stool 1 14.75" 14.75" 32.5"
If you enjoy unique style with an urban edge, the mission-style Studio Home living collection is just your type. 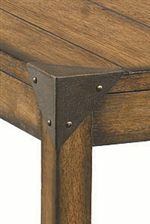 Each piece is finished in a warm, weathered oak for a natural, soothing brown color palette with matching metal accents giving a trendy, industrial style. Featuring bookcase pieces and a large architect desk, this collection not only brings you style, but convenient storage and display room for your living room, home office, and bedroom. Whether you are decorating your loft, apartment, or home, the Studio Home living collection can be interpreted anyway you want to effortlessly enhance the unique beauty of your interior space. The Studio Home collection is a great option if you are looking for Mission Mission furniture in the area. Browse other items in the Studio Home collection from AHFA in the area.